These Whole30 grocery lists will help you find everything you’re looking for and everything that’s compliant while shopping at these major grocery chains. There’s a Whole30 shopping list to show you what’s Whole30 at Target, Trader Joe’s, Walmart, and Costco. To make Whole30 as easy as possible and help you be successful, the images and descriptions in these posts make sure you know exactly what you can expect to find at most locations! While it’s always necessary to read your labels, all of the products in these Whole30 grocery lists are Whole30 Approved or compliant. However, because companies can change their product ingredients and labeling, and some stores may carry different products, always be sure to double check. If you’re like me, you really like lists. And, of course, staying Whole30 compliant on a round! I created these lists to help you know what you’re looking for, not spend a million hours in the store, and be confident when it comes to navigating the aisles at a store. It was really overwhelming for me, so I hope that these can help you have your most successful Whole30, and life changing round yet! Click image to see the Target Whole30 grocery guide! This Target Whole30 Grocery Guide has over 50 items that are Whole30 compliant. It’s easier to do all of your shopping at Super Target’s now more than ever. Target now carries Whole30 Approved bacon from Applegate and Pederson’s (in select stores), and Tribali burgers! 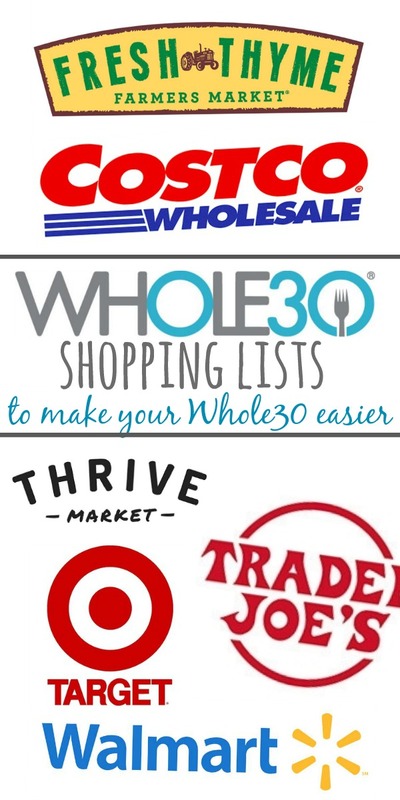 Check out the Target Whole30 Shopping Guide and 50+ compliant options! Click the image to check out the Thrive Market Whole30 Post! Whole30 Thrive Market products that are on this shopping list include many things you can get at Whole Foods, but at Costco prices. Everything is 25-50% off retail price, and delivered to your door. Many of the Whole30 Approved products are on Thrive, and they also have many of their own branded products that are much cheaper than, say, Whole Foods. Such as almond flour, cassava flour, ghee, canned tuna, and more! Check out the Thrive Market Whole30 Shopping List! Click to see the Whole30 Walmart Grocery Options! 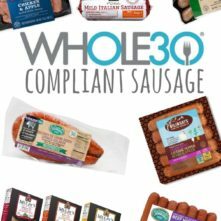 The Whole30 Walmart post contains over 80 Whole30 compliant products and options ranging from fresh guacamole, chicken sausages, chicken broth and more. Walmart has been stepping up its game lately and you’ll find many healthy options for your Whole30 such as almond flour and even Whole30 compliant hash browns! 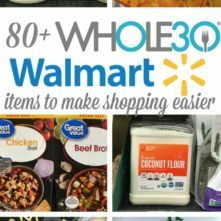 Check out the 80+ Whole30 products in the Walmart shopping guide! Click for the Whole30 Trader Joe’s List! Trader Joe’s is a Whole30 gold mine too! There’s so many compliant options here. You can get dressings, meats, ghee, and almost any pantry staple you could need! Check out the Whole30 Trader Joe’s Shopping List! Click image for the Whole30 Fresh Thyme list! This Fresh Thyme Whole30 shopping list includes so many Whole30 Approved brands, and even more Fresh Thyme brand items that are Whole30 compliant. Fresh Thyme is one of my favorite places because of their great prices and healthy brand products. You’ll find frozen cauliflower rice and other veggies, more than 4 flavors of Whole30 compliant marinara sauce, and any and all kinds of sauces and dressings! 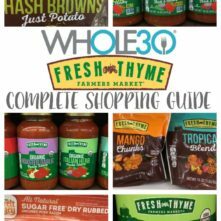 Check out the Whole30 Fresh Thyme Shopping List! Click for the Whole30 Costco shopping list! Costco Whole30 finds are getting more and more easy to come by.. and in bulk! Beyond just fruits and veggies, you can grab kombucha, deli turkey meat that’s Whole30 compliant, almond butter, Kerry Gold to make your own gee, and more. The bonus with buying Whole30 Costco items is that you get so much you’ll never have to buy almond flour ever again! Check out the Costco Whole30 Shopping List! For more awesome Whole30 lists that make shopping (and Whole30 life) easier, check out these resources! As I add resources and Whole30 shopping lists for other stores, I’ll keep updating this list! If there’s anywhere specifically you’d like to see, please don’t hesitate to let me know! Making the Whole30 easier and less stressful or overwhelming for you is my goal! I hope this Whole30 shopping list round up helps you navigate the store with ease!